What is a Rotary Instrument? To accept burs to remove caries and for cavity preparation. To take prophy cups for prophylaxis. Designed to take Latch Type (RA) burs (most common for low speed handpieces) or Friction Grip (FG) burs (similar to high speed handpieces). No technical advantage of one over another. Push button heads are considered more convenient for bur changes, but they are generally much more expensive and have more mechanical parts that can fail. 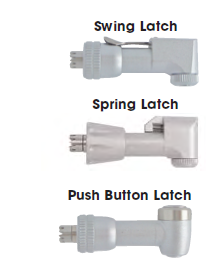 We believe that spring latch heads provide the ease of push button but the reliability of swing latch. 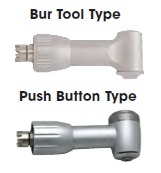 Push button heads provide the convenience of quick and easy bur changes but cost significantly more and fail more quickly than bur tool types. There are two primary designs for attaching the prophy cup to the head: snap-on and screw-type. Heads are rated on capability: 20K, 30K, 40K. 20K, 30K, 40K heads all perform the same function; the primary difference between heads of different ratings is the longevity of the head. 40K RPM (highest rating): internal components include a ball bearing cartridge which extends the life of the head under normal operating conditions. 40K RPM rating means that the head can handle the stresses of this speed (although most slow speed motors do not exceed 20,000 RPM). 30K RPM (middle range rating): has an oil-impregnated brass bushing to reduce friction and improve longevity. 20K RPM (lowest range rating): does not contain any special friction-reducing components and therefore has the shortest operating life. However, a 20K RPM head is still adequate for all low speed motor applications, and with proper maintenance should provide a dentist with a useful life and great value. Choices should be made based upon frequency and type of use. 10:1 Gear Reduction (very slow and high-torque). Endodontic 1⁄4 Turn (the bur does not spin but rotates back and forth). Mini (small head for better access). All the same configurations, rating, and options available for heads are also available in U-Type contra angles, either for a doriot-type handpiece or a nose cone/straight attachment.